Cars with online capabilities are set to be the next big thing on our roads, some are all ready available, and it will inevitably become common place in the coming years. Ever find yourself sat in traffic wondering what an old friend from school who you no longer talk to is having for dinner? Well it seems that you will not have to wonder much longer, for analysts have predicted that major manufacturers will begin producing their cars with internet capabilities as standard. There are already a number of online cars available, including the BMW 3 Series. The online world through the car is much different to that of your smart phone or desktop to help ensure that safety is not compromised. 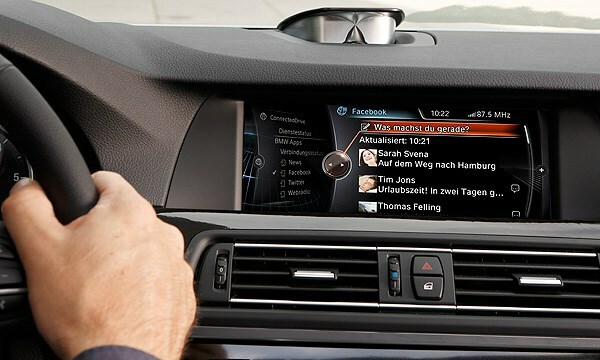 This means that most of your cars online experience will come through apps, whereby latest statuses are read out to you and you can choose to reply by voice recognition technology or steering wheel buttons. To be quite honest though we are not interested in the ‘social network’ side of things at all, our lives are already awash with facebook and twitter updates, without having them built into our cars. But there could be some very useful apps which come as a result of the online cars such as apps which can find an empty parking space in a car park or locate the cheapest fuel price in your area. If my experience with smart devices is anything to go by, they will probably cause more frustration than anything, what with apps not functioning properly, screens freezing at crucial moments and stupid games getting the better of you, it will also probably be a cause for higher service charges, but hey, at least you could book your car service online whilst driving.